Rich malt flavor, hints of biscuit and nutlike Flavors. 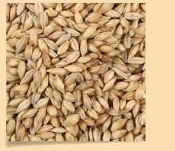 Use as a rich malty 2-Row base malt. Contributes golden color. A fully modified, high extract, low protein malt. Not just a darker 2-Row Base Malt. Its very unique recipe results in the development of a very unique flavor. Sufficient enzymes to suport the inclusion of event the most demanding specialty malts without extending the brewing cycle.